This damp and rainy winter, spring and summer has provided ideal conditions for fungal growth and a real bonanza for wild mushrooms. They seem to be everywhere this year, from a few Dryad’s saddle hanging onto the sides of stressed out trees, to hundreds of tiny Japanese parasols (Parasola plicatilis) making little fungal forests in my lawn. I even found a few buttons sprouting from a couple of debris filled cracks in my deck that I probably should have cleaned out in the spring. Naturally, these wet conditions have also created a lot of excitement among knowledgeable fungi stalkers who make a sport of truffling around the forest looking for the mother lode of morels or a bushel or two of brackets. Unfortunately, for every expert forager, there are also the stories of inexperienced mushroom scavengers who end up in the hospital after a finding what they think is an edible delicacy. Or worse, the unfortunate amateur who makes the six o’clock news by accidentally spicing up the spaghetti sauce with an Amanita phalloides (Death cap). I’ll start right off by telling you that I’m not one of those people that are brave or crazy enough to eat wild mushrooms. My feeding on fungi is usually confined to those in Styrofoam trays and bulk boxes from the supermarket or the well-brewed fungal yeast in beer – and on one memorable occasion a sizable chunk of French truffle at a nobby Saint-Malo restaurant that was freshly sniffed out by a continental porker and cost as much as a second hand Volkswagen. However, last year I threw my wobbly skepticism out of the window and actually ate a wild mushroom that one of my colleagues had hauled out of the woods. Not only did I enjoy its exotic flavour, I actually lived to tell the tale. 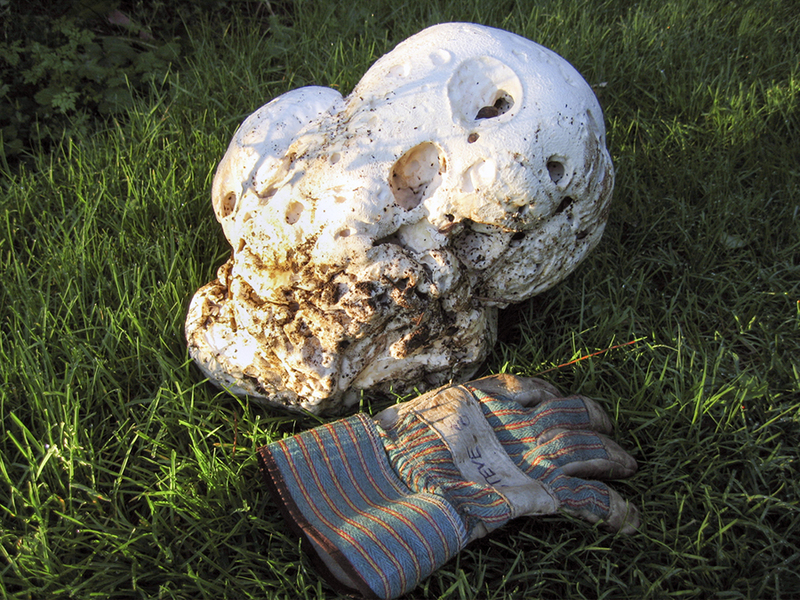 The wild mushroom was a giant puffball (Calvatia gigantea), commonly found in undisturbed forests from late summer through September and sometimes even as late as early October. The name Calvatia is a combination of the Latin words calvus and calvaria which when put together mean “bald dome of the skull.” Its name is entirely appropriate for these massive pure white soccer ball-sized orbs because some have such a shocking resemblance to a human skull that the first time the uninitiated stumble across one in the wild they don’t know whether to kick it through the goal posts or call the homicide squad. That’s not a skull, it’s an example of what the puffball mushroom looks like when it gets past its best before date and has insect damage. But for the experienced fungi fans on the hunt, puffballs are easily spotted when they suddenly appear baseball sized on the forest floor and then rapidly inflate overnight like blown up balloons. But timing is everything when harvesting because the local wildlife find them equally as tasty as humans and once small mammals and insects get their mitts on them they will be rendered inedible about 48 hours after reaching their mature size. It’s extremely rare to see giant puffballs for retail sale in Ontario but they are very popular in the United Kingdom and many other parts of Europe where they are sold in farmers markets and prized for their flavour, which tastes similar to an earthy tofu with a texture of soft cheese. They are pretty well foolproof as far as identification goes, but don’t take my word for it – there are a few imposters out there that can give you a nasty tummy ache. On the other hand, if you find what you think is an authentic puffball, it should always be sliced open to look for insect damage and confirm its identity. Mature specimens are usually large irregularly shaped globes without a stem or stalk with an interior that has a smooth pure white texture with no discolouration, visible gills or other irregular structures. 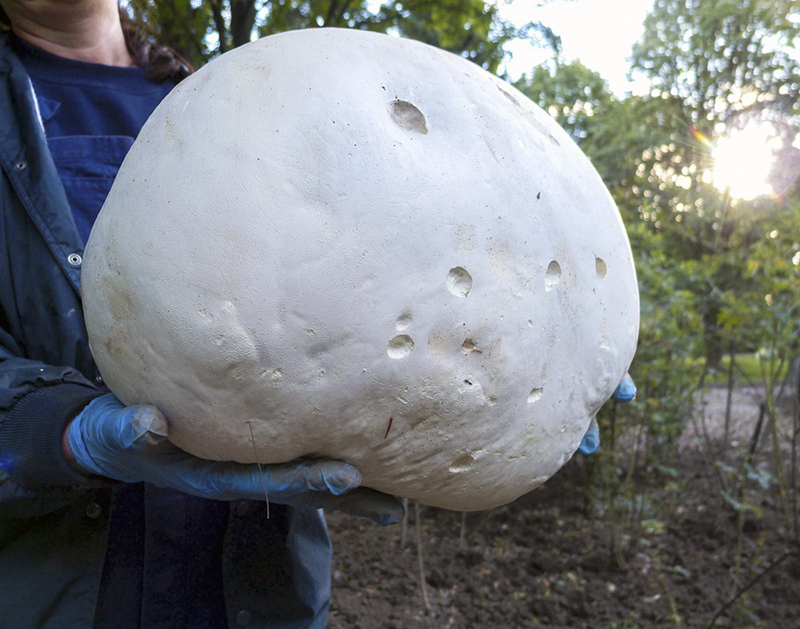 Of course, giant puffballs may be easy to identify but picking other mushrooms for food can be a dangerous activity. It is always recommended that novice pickers join an organization that regularly schedules foraging trips, or have an experienced mycologist examine any fleshy fungi before you before you commit it to the dinner plate. Steven Chadwick is a professional gardener, horticulturist, and long-time Beach resident.